If you fancied a break from Brexit this week, you might have turned instead to the astronomical news. In which case, you’ll have added a smidgin of Hawaiian to your linguistic utility belt. The word in question being Powehi – ‘the adorned fathomless dark creation’. How often you get to use it in casual conversation remains to be seen – “the adorned fathomless dark creation” is not the sort of thing you say in passing to the newsagent as you pop in for your morning paper, unless that’s what you happen to call the Daily Mail – but you have to take your hat off to a language that can say all that in one word. It’s funny how the same word in two languages can mean very different things. In Hawaiian, Po is ‘a profound dark source of unending creation’. In English it’s a toilet. Same thing, you might say. If you didn’t follow the astronomical news, I should explain that Powehi is the name that has been given to a black hole, which became the first black hole to have its picture taken this week. This, apparently, is proof that black holes exist, just as this footage is proof that the Yeti exists.  Without wanting to come across as a black hole denier, a fuzzy orange ring on a computer screen could be anything, couldn’t it? You can get something similar by spilling a gin and tonic on your keyboard. Trust me, I know. But setting black holes aside for one minute, contemplate, if you will, the word ‘space’. It’s an incredibly versatile word. In English we have a number of ‘quantity’ words, which, though inexact, give a fairly close approximation to the quantity we’re talking about; ‘a number’ being a case in point; a few, several, a bunch, lots, loads, hoards and multitudes being others. But space? Space does all the work on its own. It covers everything from the tiny gap between two words to the infinite emptiness of the Universe. That’s a pretty broad range. Yet we still have a good idea of the magnitude implied whenever we hear or see the word space. For example, if you said, “I just need some space,” I would know that you didn’t mean a portion of the void between Saturn and Jupiter. You might not even mean physical space, you might mean time or some other figurative form of nothingness. The space of five minutes, say, might be enough breathing space to give you some headspace. Up until the 1700s this was how we used the word space (from the Latin ‘spatium’ via the French ‘espace’, meaning a large people carrier): an interval, a period of time, an enclosed area, an open area, the distance between things… Amazing. Then some bright spark upped the ante further still by pointing his telescope at the night sky and, with breathtaking understatement, calling the black bit Space. And so Space became a place – a rather vague, baffling place where adorned fathomless dark creations float around being vacuous and grab the headlines for having their picture taken. A bit like Brussels.